Hash Auger offers a number of options that can be used to improve mining profitability. Some of these settings can be used to improve the accuracy of earnings estimates. Other settings can prevent mining on pool ports that are under or over worked; often earnings are lower than estimated when too few or too many miners are working on the same port on a mining pool. New users should consider using the following settings to avoid losing potential earnings. Minimum Earnings Amount - this setting prevents Hash Auger from mining with a GPU if the estimated earnings are too low. The software will exclude any work with an estimated earnings below the specified amount; if no work is available, the software will simply stop mining with the GPU until there is work with higher earnings estimates. 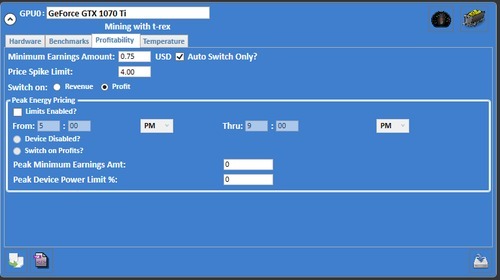 This setting can help control electricity costs by preventing the software from mining when estimates are too low. Price Spike Limit - a Price Spike Limit can be set for each GPU to exclude any work whose estimate is higher than the specified amount. For example, if the Price Spike Limit is $5, Hash Auger will ignore any work for that GPU that has higher estimated earnings. Occasionally, due to data issues, extreme fluctuations in coin values or inaccuracies in the coin network or difficulty information, the estimated earnings for some coins can briefly spike much higher than the coin's actual value. Without the Price Spike Limit, algorithm-switching software will often mine these coins as the inaccurate estimates are usually the highest. A recommended value for the Price Spike Limit is 150 - 200% of a GPU's average daily earnings; for example, $3.50 to $4.00 for a GPU that usually earns $2.00 daily. This provides some flexibility if earnings increase for legitimate reasons while still ignoring work with inflated and inaccurate estimates. 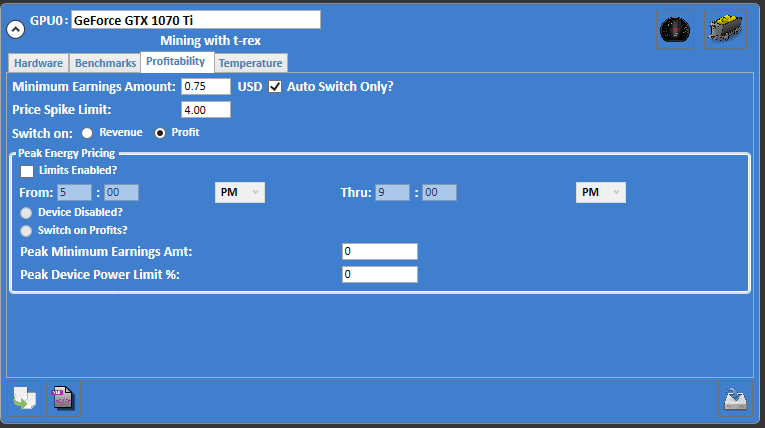 Switch on Profit - while Hash Auger defaults to switching work based on estimated revenue, this setting can be used to reduce the cost of mining by switching on estimated profits instead. Profit estimates include the average electricity cost of mining each algorithm that is automatically captured during benchmarking and revised while mining. This cost is then subtracted from the estimated earnings to determine how much profit the work will create for the user. Since different algorithms and various mining programs utilize GPUs differently, power consumption can vary considerably between algorithms and different mining programs for the same algorithm. When switching on profit, Hash Auger attempts to use the most efficient algorithms and mining programs. The following settings are set for each pool that has been enabled by the user. Not every pool supports all of these options. Average Recent Estimates Although the Price Spike Limit can prevent the software from mining work with significantly inaccurate estimates, there are often times that estimates for certain algorithms and coins will swing wildly over short durations. Without price averaging, there is a chance that the software will switch work based on a brief spike or dip in value. Price averaging calculates the value of each port or coin on a pool based on recently collected data. This setting filters out most extreme price fluctuations and helps improve the accuracy of the estimated earnings. 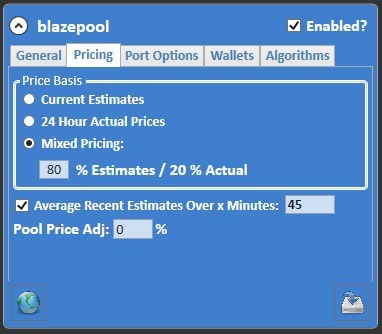 Price Basis Many pools provide both recent actual and estimated earnings for each algorithm or coin port. Most miners prefer current estimates as they reflect the current market conditions, pool usage and coin values. However, the accuracy of these estimates can sometimes be skewed by sudden changes in coin values or mining work on the pool. Therefore, using mixed pricing can help improve the accuracy of estimated earnings by basing calculations on both sets of data. While it is often necessary to adjust the mixed Price Basis for each pool for optimal performance, most users begin with a mix of 80% Estimates and 20% Actual and then tune each pool separately. Advanced users can use the Algorithms or Coins tab can be used to define price basis percentages for specific algorithms and coins. 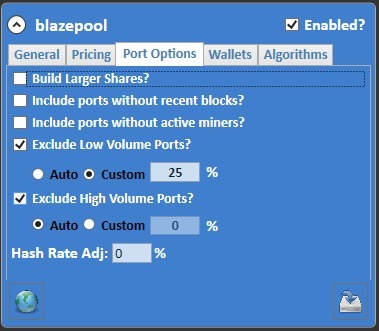 Exclude Low Volume Ports This setting prevents the user from mining on algorithms or ports that do not currently have much mining activity. Often, mining on a low volume port can cause a significant delay in earnings as it can take hours or even days for the pool to find the next block reward. Beginners can use the Auto setting to have the software exclude ports when a rig's combined hash rate is a large share of a port's current mining activity. Advanced users can define their own settings both for the pool and specific algorithm/coin ports to further adjust this feature. Exclude High Volume Ports Similarly, ports that have a large number of miners can also affect earnings if the user's mining input is only a small fraction of the port's total work. Typically, ports with too much mining activity have higher difficulty levels for finding new blocks. Also, individual miners will have a smaller share in any rewards and there is a greater chance that some or all of their shares will be discarded on some pools if the next block is not found within a certain amount of time. Due to these factors, actual earnings from these high-volume ports is often considerably lower than estimated earnings. Therefore, many users with small mining operations (several or fewer GPUs) often benefit by ignoring these overworked ports regardless of the earnings estimates. The Auto setting will prevent mining on ports with the highest volumes, but advanced users may want to define even stricter settings using custom limits for the pool and specific algorithms/coins.